Criticism is mounting for D.C. Mayor Muriel Bowser's plan to help ease rising water bills after a News4 I-Team investigation exposed how a growing fee is threatening churches, non-profits and other groups across the District. Just one day after religious leaders representing hundreds of churches, synagogues and cemeteries flooded D.C. Council to express concern, the reality of the mayor's math is setting in. "Well it's disappointing, to be honest," said Craig Muckle, spokesperson for the Archdiocese of Washington. "We have to do a lot of work on this to make our point heard and to see how we can move the needle even more." 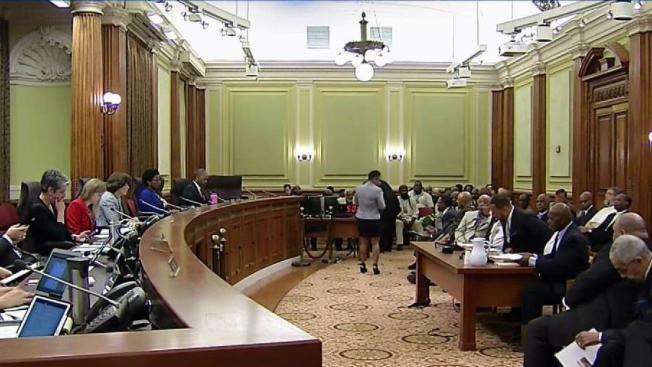 There's been widespread criticism, even from council members, saying the $6 million Bowser promised isn't nearly enough to attack the problem of rising water bills. Bowser plans to create a hardship fund to subsidize bills, but the I-Team has learned nearly 75 percent of the money would be off-limits to the nonprofits, churches and cemeteries who've been hurt the most. Last fall, a News4 I-Team investigation showed how some churches and cemeteries are paying hundreds of thousands of dollars a year just for one fee called the Clean Rivers Impervious Area Charge. The fee, enacted to fund construction of tunnels to keep sewage out of our rivers, has grown exponentially in the past few years. Some smaller churches now have water bills higher than their monthly mortgage payments, and have had to cut community programs. "You need to feel the pain that we feel," the Rev. Clarence Cross testified during Tuesday's hearing. During the hearing, the mayor's budget director, Jenny Reed, unveiled specific details of the proposed hardship program, including that the bulk of the money, $8.5 million, would be earmarked for residents only. According to data reviewed by the I-Team, the majority of residents pay the lowest rate for the Clean Rivers fee, $25.18 per month. "The administration believes that targeted relief for low and moderate income residential rate payers and non-profits that demonstrate a hardship is a more beneficial policy," Reed testified during the hearing. But there's been a widespread call for the District to pay $40 million after the I-Team revealed the largest areas creating stormwater runoff — public roads, sidewalks and alleys — have all been exempt from the fee since its inception. A consultant recommended the exemption, and DC Water approved it a decade ago, with little discussion. Reed testified that the District could find no other city that pays a fee for the impervious area of its roadways. "I don't really care if no other place does it, I'm asking whether we should do it, because maybe that would be fairer," responded Councilwoman Mary Cheh, who hosted the hearing. Cheh has held several hearings and engaged the community in trying to find sources of revenue to offset the Clean Rivers fee. Possibilities include renegotiating a federal consent decree mandating the reduction of sewage overflows, increasing the contribution from surrounding communities outside the District, even finding a way to charge developers or tourists who also benefit from cleaner rivers. "It's clear that the hardship is real and it's severe, and the way DC Water has allocated this fee is inequitable and unfair," said Cheh. "And so we need to get to some solutions." Former DC Water Board member Alan Roth, who served on the rates committee when the fee was enacted, told Cheh the council needs to "take the bull by the horns" and that the mayor's $6 million proposal is "wholly inadequate." "The mayor's plan really strikes me as a sham," Roth told the I-Team, adding that he believes the public roads exemption should be revoked. "If the council came up with the $40 million or so," said Roth, "then everybody's bills would go down very, very substantially." How substantially? The I-Team calculated and DC Water confirmed the Clean Rivers fee would drop, for all customers, by about 40 percent. But Reed told the I-Team $6 million is all the District can spare. "We have to look at all the needs across the city as we're determining how we're going to allocate those funds," said Reed. "It's not an unlimited pot of money, unfortunately." If the budget is approved as is, 6,000 or so nonprofits and churches would have to share about $3 million. The District estimates about half of those would apply for the help. "That's literally $1,000 give or take on average; that's not real relief in our minds," said Muckle. "What is the will of the council to kick this back to the mayor and say this is not going to work?" the Rev. Keith Byrd of Zion Baptist Church pressed Cheh and Elissa Silverman, the only other council member present for the hearing. Cheh told the I-Team she will try to eek out additional money from the mayor's proposed budget before next week's council vote, but she acknowledged that won't come anywhere near $40 million.